Join the discussion on our forums! 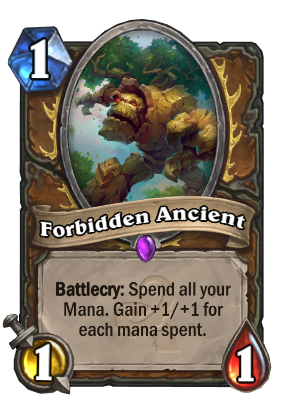 Come discuss Forbidden Ancient over in our dedicated Forbidden Ancient discussion topic. I have a golden one, and I need 700 more dust to craft Vek'lor. Should I disenchant it, along with Cyclopian horror, Scaled Nightmare, Renounce Darkness, and/or Twilight Summoner? I think this card is highly overrated. Yes it's flexible, but does Druid really need anymore vanilla minions? I don't think so. Firstly most of the time you would only use this card in mid-game, preferably as a 10/10. Reason? Cuz throwing down a 3/3 minion with no effect at all is the single most desperate move you could do as a Druid. Forbidden shaping is totally another story, since it can get minions not just from neutral but any other class, and when you play it on 8-mana you get great minions most of the time . Even forbidden flame can be cast as a zero-mana spell (and at least get the synergy), can benefit from spell-damage, and it is instant impact on the board. And it dies to earth shock, instantly. This card will also do well when you've no more cards in your hand and need to make a comeback on the board. Are you sure? I doubt if second Battlecry don't gain anymore because you won't have mana on second trigger but Text said "Gain +1/+1 for each mana spent." It does not do anything with Brann..
Will this be a 1 mana 2/2? I'm spending all of my 1 mana on turn 1 to cast this so by the text it should buff it by +1/+1. It is a forbidden card. Might be on the med-core side of the cards released, but for some reason this is my favorite card. Ramping out big dudes is just so awesome to me. I wish they made this the "Tarmagoyf" of hearthstone and gave it +2/+1 for each mana spent. Why is this an epic, am I missing someting crazy about this card ?? ?